Hey humans what’s up which yous? My name is Vinny an’ I’m a Shepherd/Corgi somethin’ else, but who knows what, an’ I’m ’bout 2 years old. I showed up at Christine’s house one day, an’ she was worried ’bout me cuz it was hot out, an’ I’m all black, an’ she gave me some water an’ gained my trust… so she brought me here. I’ve got heartworms, so I’m goin’ through treatment for it, an’ lemme tell yous… it stinks! But, I gotsta do it so I get better an’ live a looonnng life. I’m healthy as a dog can be, ‘cept for da heartworms. So, lemme tell yous ’bout me an’ my personality. I’m a pretty smart guy, I learn stuff real fast, like obedience stuff (I’ve learned how to “sit”, an’ I’m workin’ on layin’ down), an’ I make real good eye contact wit’ da human who’s workin’ with me. Our humans (both volunteers an’ staff) started some obedience classes for all us dogs here at the shelter, so we can learn stuff to impress potential adopters. Wit me, it’s just a bonus that I’ll know how-ta do some stuff, anybody who’s gonna meet me is gonna fall in love wit me cuz I’m charming, sweet, an’ good wit other dogs. I’m an all ’round nice guy! An’ I’m house-trained unlike some ah da other dogs. Sometimes, I’m a bit shy when I meet new human men, but after I getta treat or somethin’, an’ I check ’em out, I’m fine. One thing yous gotta know ’bout me is I got lots an’ lots to say, an’ cuz I can’t really “talk” to yous guys, I bark… a LOT. But, hey, what can yous expect when I’m hangin’ out wit 3 other dogs in a “quiet” room all day? I gotta stay in there since I’m goin’ thru heartworm treatment cuz our humans said I gotsta stay quiet (ha, ha) so I don’t get all worked up bein’ out wit all da other dogs… an’ I know they’re all lookin’ out for me so I ain’t real upset ’bout it, but it’s kinda borin’ sometimes. I really like goin’ on walks, like da pack walks, an’ da obedience classes, an’ satellite adoption events, an’ just chillin’ wit humans like Pete, Alex, Christine, Kate, an’ volunteers. Anyways, I’m gonna go for now, just wanted to tell yous guys ’bout me so yous know I’m here an’ ready for a forever home. 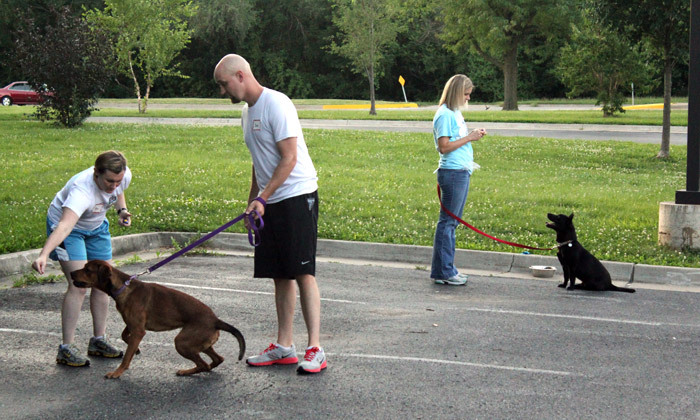 This is me in obedience class… I’m da well-behaved an’ good-lookin’ one. Hey humans what’s going on?!?! I’m not likin’ all this real hot weather…ya know with my black coat an’ all. 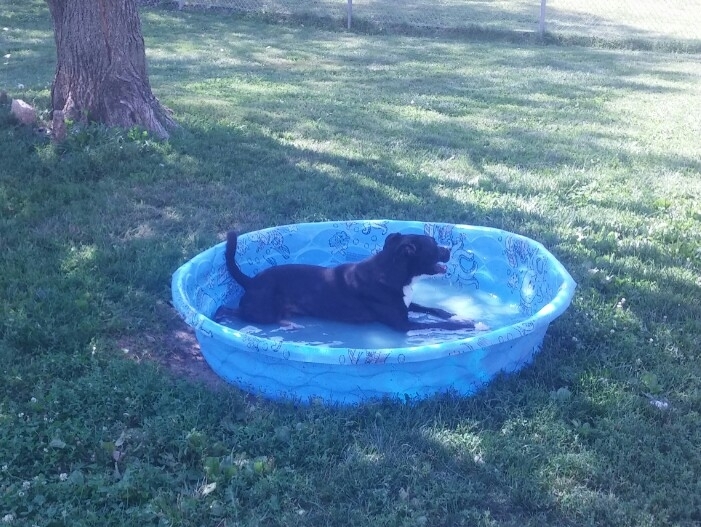 But, I really like coolin’ off in the kiddy pool our awesome humans have for us in one of our yards. After playin’ in a play group with Aster, Ella, Nemo, an’ Tommy Boy (he’s a cool lil dude, but not available for adoption just yet), I like to go lay in the pool an’ cool off. I love play groups! I like chasin’ other dogs, an’ bein’ chased, an’ playin’ tug with a big rope toy, too. I think play groups are AWESOME! I’m always tired after runnin’ ’round playin’ with my doggy friends, an’ it’s good for all of us ’cause we learn how to play with each other. Watchin’ us play helps our humans learn stuff ’bout us, like how we play, who we like or play with really well, an’ who we don’t get along with as well. Stuff like that’s important for Christine who’s kinda like a big sis to all of the dogs here ’cause she tries to make great matches for us so we can go to forever homes of our own. That’s what I wanna tell ya ’bout…my ideal forever home. 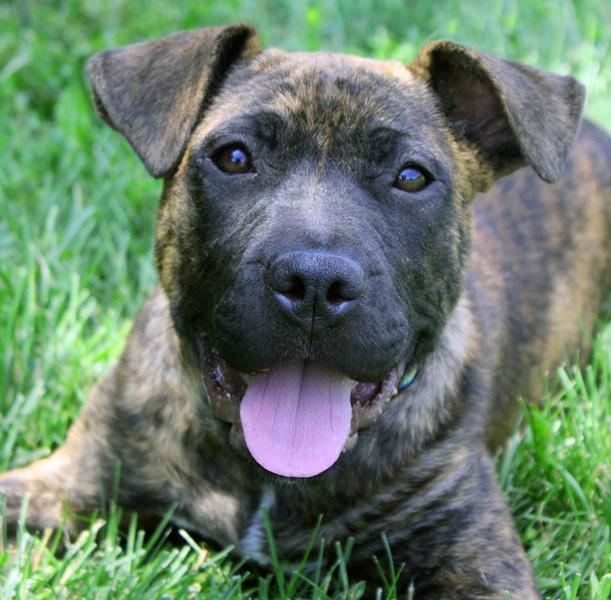 I’m a Pit Bull mix, so I have go to a city where we’re “legal”…whatever that means. I’d probably do ok in an apartment ’cause I’m not real loud, as long as I get enough exercise before you leave me to go to work or whatever it is you humans do all day. I’d prefer a house with a fenced in yard ’cause I love to play fetch, an’ play with other dogs. I’d love goin’ to a home with another dog, or with one of my friends from here…that’d be really awesome! 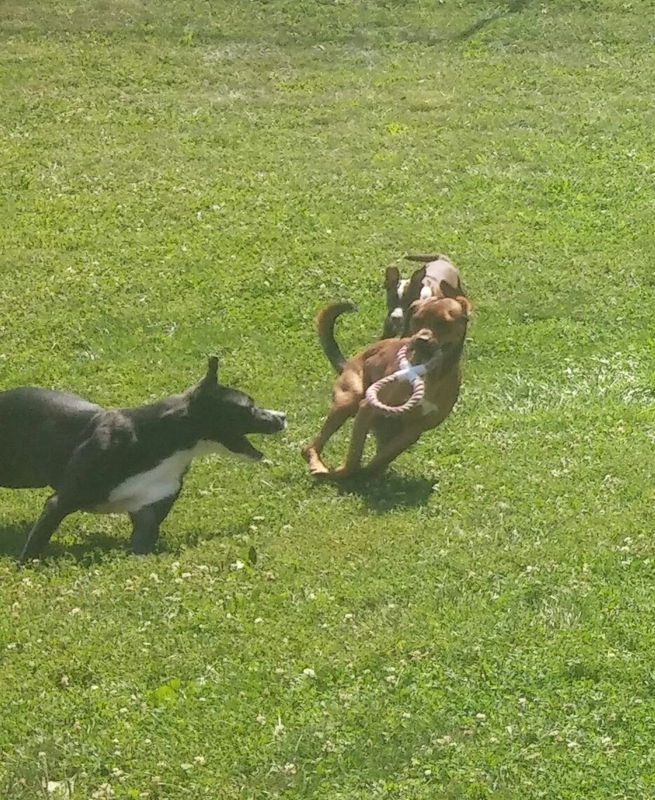 30 minutes of play time with another dog or 3 is a great way for us to burn off some energy…even better than walks or runs. I’d be ok with small humans, but maybe not too small ’cause I do like to give hugs (I jump up an’ wrap my paws ’round a humans waist), an’ our humans think this is kinda cute an’ sweet, so they don’t always make me “sit”. I gotta admit, I shouldn’t go to a home with cats, though, ’cause I like to chase them, I don’t know what’s wrong with that, but I know our humans don’t like it when I do that. I’m workin’ on my leash manners when I go on pack walks, an’ am pretty good. I like most dogs I meet, but who’s gonna like everyone they meet, huh? I prefer dogs my size or smaller, an’ when I’m on a leash, I get nervous if a male dog bigger than me gets close. I don’t do anything bad, but I bark a bit, so maybe humans who have some experience with dogs would probably be good for me. I have played with dogs bigger than me, but when I’m on a leash I get a lil bit nervous. That’s all I got for now! I’m tired after playin’ with my friends this morning, so I’m gonna go for now. Check out our website for more info ’bout me, an’ how to go about meetin’ me (our adoption process, and online applications). Bye! Me chillin’ in the pool to cool off. 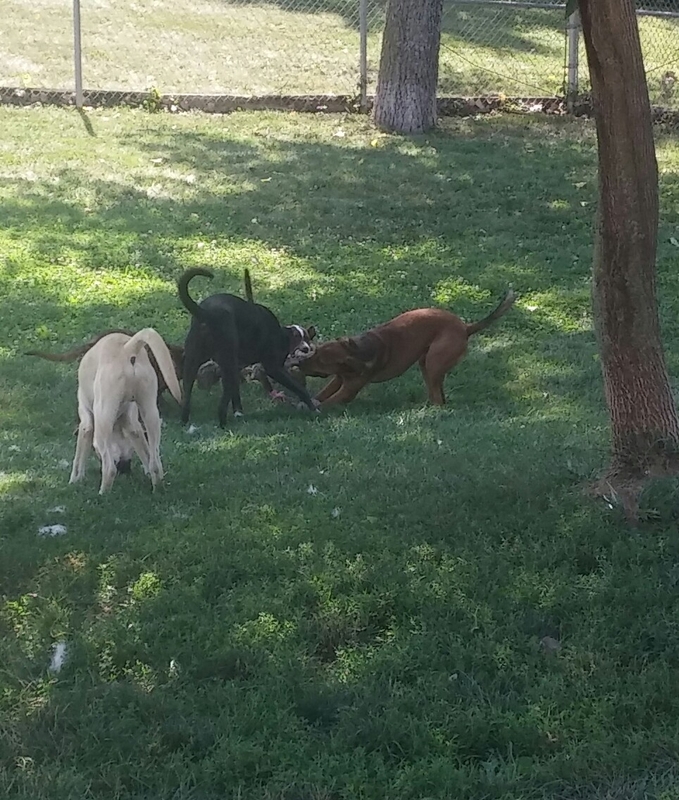 Me, Nemo, Aster, an’ Ella playin’ tug an’ Tommy Boy’s just hangin’ out. hi my name is Bandit. i’m about 6 months old, an’ came here ’cause one of the humans who works here found me runnin’ the streets, an’ was worried ’bout me so she brought me here. i’d tell ya what my breed is, but no one really knows for sure, but i’ve heard i got some “pit bull” in me… i dunno totally what that means, but i guess it means there aren’t alotta places i can go for a forever home. 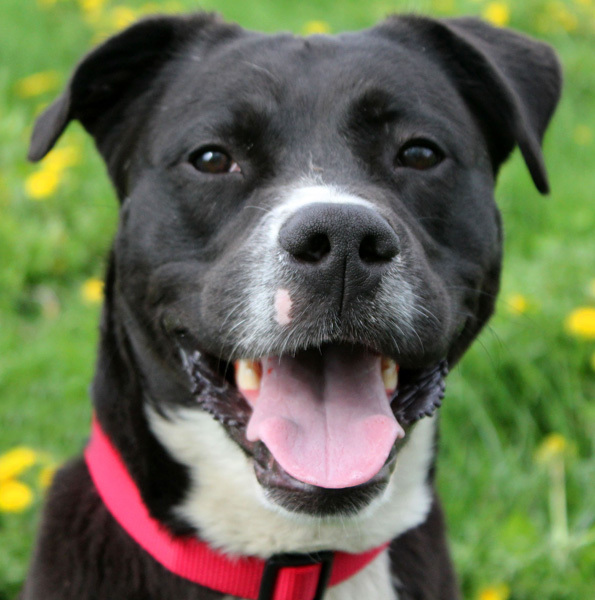 i’ll let one of the grown up pit bull mixes like Darla tell ya ’bout why it’s hard for pit bull an’ pit bull mixes to find forever homes… i’m just a kid an’ i’m still learnin’ ’bout lots an’ lots of stuff, an’ there’s always like lots of stuff goin’ on. k, so here’s a lil’ info ’bout me… i’m a pretty energetic boy who loves playin’ with other doggies, like my roommate, Aster, an’ in play groups with Nemo, an’ Remy, an’ i get to go to satellite adoption events sometimes, too, which i love goin’ to ’cause i get to meet new humans! they give me treats, an’ tell me how cute i am, too, which i am! this saturday, july 19, i’ll be at the satellite event at Brookside Barkery & Bath from 11-3. come meet me and some other dogs and kittens there! more about me… i like to “talk” lots, ’cause i’m so excited an’ i’ve got lots to say! when i get to go on a pack walk, or just out to the yard to play, i bark at all the other dogs to tell ’em what’s up! hey… they may wanna know, an’ even if they don’t, i tell ’em anyway! i love goin’ on pack walks, too! i’m pretty good on a leash, an’ am learnin’ stuff like how to “sit” when asked… Alex and Lea Ann make me “sit” when i get my breakfast, an’ i do ’cause they ask so nice an’ make a real big deal when i do it! i think i’m a pretty smart pup, but sometimes it takes me a few seconds to focus an’ understand what a new person is askin’ me… so if i don’t know ya, gimme a couple seconds an’ i’ll sit for ya, especially for food an’ yummy treats. if i could chose my own forever home an’ new family, i’d really love to have a doggy brother or sister, like Aster (i love her lots! ), ’cause i like to play so much, an’ runnin’ ’round playin’ with dogs is a real good way for us dogs to burn off energy! i’d be ok as the only pet if ya wanna run or jog, or like to go on lots of walks. i like splashin’ ’round in the kiddy pool our humans have for us… then i run an’ jump on one of them when they come get me to take me back inside, an’ i get ’em all wet!! hee hee, they don’t like it always, but they’re usually pretty good sports ’bout it, an’ i like to jump lots anyways. i probably should live in a house, not an apartment or duplex ’cause i do like to talk lots. i’m pretty good with small humans, but ’cause i’m still workin’ on manners, i probably shouldn’t be in a home with real small humans. anyways… it’s time to settle in for the night, so bye for now! hi my name is Ella! 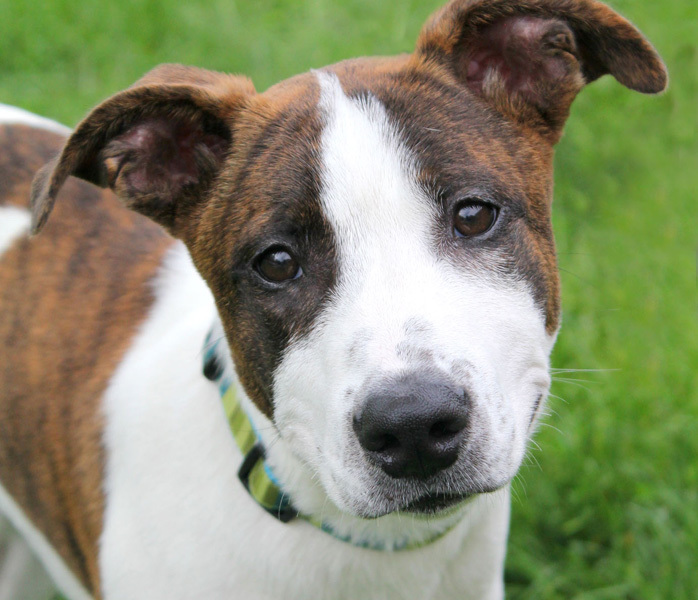 i’m a 5 month old pit bull mix who came here in May ’cause the humans who had me before didn’t take real good care of me, an’ then couldn’t afford to treat somethin’ i have called dee-mo-dex mange. from listening to our humans, (an’ Darla told me ’bout it, too. she’s my roommate, btw), dee-mo-dex is a lil tiny mite that lives in the hair follicles of dogs, an’ all of us have some, but if we aren’t real healthy, then the stupid lil mites take advantage of us an’ make more mites so we lose our fur. it’s not con-tay-giss to other dogs, but it takes a long time for the medicine i gotta take to work. i also had somethin’ happen to my hips (i needed pictures taken of my bones, an’ my former humans couldn’t afford those either). nothin’ was broken, but i don’t run real fast. our humans don’t think the humans who had me before were real nice to me, so some stuff scares me lots… like if i gotta be held so the doggie doctors can scrape my skin to check for the lil mites, i growl at the humans holdin’ me some… i don’t wanna be mean or nothin’ i’m just real afraid. i wanna go to a home again, but i need to go to some humans who are super nice an’ have lots of patience to help me with the stuff i’m scared of. maybe i shouldn’t go with small humans ’cause from what Darla’s told me they like to give “hugs”, an’ are real excitable, an’ might scare me. Darla’s an awesome roommate ’cause she’s tellin’ me lots an’ lots of stuff ’bout really nice humans, an’ she plays with me in the yard an’ kinda looks out for me. she’s like a big sis to me, an’ she sleeps next to me every night even tho she could sleep on her own bed. i do like most other dogs, but I play kinda rough so medium and big dogs are best for me. 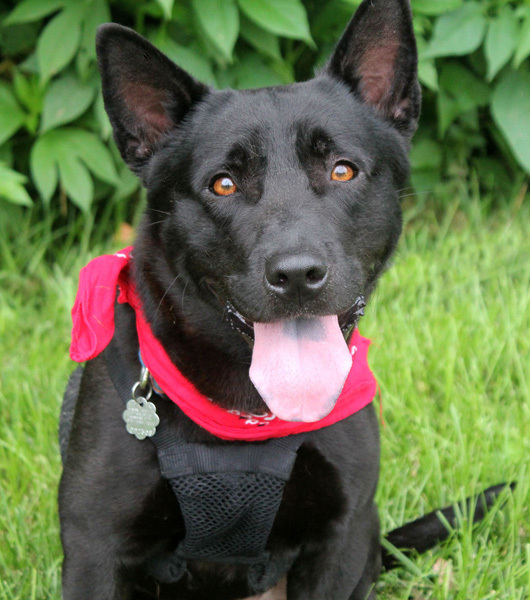 i’m excited ’bout somethin’ i wanna tell ya ’bout… i get to go to a satellite adoption event on saturday with Darla! it’s called “Dead Girl Derby” from 5-8 at Hale Arena. if you wanna know more, check out our website for details. i’ve heard it’s lots an’ lots of fun to go to satellite events ’cause humans give us treats, an’ pet us, an’ make a real big deal ’bout how cute we all are. plus, Darla said this is her first real satellite she’s goin’ to which is awesome for me ’cause i can be with her… i love her… maybe some real nice humans will meet both of us an’ wanna adopt both of us! i’m gonna go for now… i’m gettin’ ready to go play with Darla! bye!